Wigan is a town in Greater Manchester, England, on the River Douglas, 7.9 miles (13 km) south-west of Bolton, 10 miles (16 km) north of Warrington and 16 miles (25.7 km) west-northwest of Manchester. Wigan is the largest settlement in the Metropolitan Borough of Wigan and is its administrative centre. The town had a population of 97,000 in 2011, whilst the wider borough had a population of 318,100. Historically in Lancashire, Wigan during classical antiquity was in the territory of the Brigantes, an ancient Celtic tribe that ruled much of what is now northern England. The Brigantes were subjugated in the Roman conquest of Britain during the 1st century, and it is asserted that the Roman settlement of Coccium was established where Wigan lies. Wigan is believed to have been incorporated as a borough in 1246 following the issue of a charter by King Henry III of England. At the end of the Middle Ages it was one of four boroughs in Lancashire established by Royal charter. During the Industrial Revolution Wigan experienced dramatic economic expansion and a rapid rise in population. Although porcelain manufacture and clock making had been major industries, Wigan became known as a major mill town and coal mining district. A coal mine was recorded in 1450 and at its peak there were 1,000 pit shafts within 5 miles (8 km) of the town centre. Mining was so extensive that a town councillor remarked that "a coal mine in the backyard was not uncommon in Wigan". Coal mining ceased during the latter part of the 20th century. Wigan Pier, a wharf on the Leeds and Liverpool Canal, was made famous by the writer George Orwell. In his book, The Road to Wigan Pier, Orwell highlighted the poor working and living conditions of the inhabitants during the 1930s. Following the decline of heavy industry in the region, Wigan Pier's warehouses and wharfs became a local heritage centre and cultural quarter. The DW Stadium is home to Wigan Athletic Football Club and Wigan Warriors Rugby League Football Club. The name Wigan has been dated to at least the 7th century and probably originally meant a "village" or "settlement". It has also been suggested that the name is Celtic, named after a person called Wigan. This may have been linked with Tre (meaning homestead) to give an original name of Trewigan. Derivation from Brythonic Celtic *wig, 'dwellling', plus the nominal suffix -an has also been suggested. The name of the town has been recorded variously as Wigan in 1199, Wygayn in 1240, and Wygan in numerous historical documents. There is very little evidence of prehistoric activity in the area, especially pre-Iron Age; however, Celtic names in the area around Wigan—such as Bryn, Makerfield and Ince—indicate that the Celtic people of Britain were active in the area in the Iron Age. The first people believed to have settled in the Wigan area were the Brigantes, a Celtic tribe who controlled most of northern Britain. In the 1st century, the area was conquered by the Romans. The late 2nd century Antonine Itinerary mentions a Roman settlement called Coccium 17 miles (27 km) from the Roman fort at Manchester (Mamucium) and 20 miles (32 km) from the fort at Ribchester (Bremetennacum). Although the distances are slightly out, it has been assumed that Coccium is Roman Wigan. Possible derivations of Coccium include from the Latin coccum, meaning "scarlet in colour, scarlet cloth", or from cocus, meaning "cook". Over the years chance finds (coins and pottery) provided clear indications that a Roman settlement existed at Wigan, although its size and status remained unknown. In 2005 investigations ahead of the Grand Arcade development, and in 2008 at the Joint Service Centre development, have proved that, without doubt, Wigan was a significant Roman site in the late first and second centuries AD. The excavated remains of ditches at Ship Yard off Millgate were consistent with use by the Roman military and possibly formed part of the defences for a fort or a temporary camp. More remarkable remains were excavated to the south, in the area of McEwen’s Yard (opposite the baths), where the foundations of a large and very important building were discovered, together with many other Roman features. It was demonstrated to be 36 metres long and 18 metres wide and had been constructed in stone with a tiled roof. It contained nine or ten rooms, including three with hypocausts. It had a colonnaded portico on the northern side, which presumably formed the main entrance. The structure's ground-plan and the presence of the hypocaust, leaves little doubt that this was a bath-house. A timber building excavated at the Joint Service Centre (top of the Wiend) has been interpreted as a barrack block. This suggests a Roman fort occupied the crest of the hill, taking advantage of the strategic position overlooking the River Douglas. It is clear from the evidence gained from these excavations that Wigan was an important Roman settlement, and was almost certainly the place referred to as Coccium in the Antonine Itinerary. In the Anglo-Saxon period, the area was probably under the control of the Northumbrians and later the Mercians. In the early 10th century there was an influx of Scandinavians expelled from Ireland. This can be seen in place names such as Scholes—now a part of Wigan—which derives from the Scandinavian skali meaning "hut". Further evidence comes from some street names in Wigan which have Scandinavian origins. Although Wigan is not mentioned in the Domesday Book, possibly because it was included in the Neweton barony (now Newton-le-Willows), it is thought that the mention of a church in the manor of Neweton is Wigan Parish Church. The rectors of the parish church were lords of the manor of Wigan, a sub-manor of Neweton, until the 19th century. Wigan was incorporated as a borough in 1246 following the issue of a charter by King Henry III to John Maunsell, the local church rector and lord of the manor. The borough was later granted another charter in 1257–1258, allowing the lord of the manor to hold a market on every Monday and two annual fairs. The town is recorded on the earliest-surviving map of Britain, the Gough Map made around 1360 which highlights its position on the main western north-south highway with distance markers to Preston and Warrington. Edward II visited Wigan in 1323 in an effort to stabilise the region which had been the source of the Banastre Rebellion in 1315. Edward stayed in nearby Upholland Priory and held court in the town over a period of several days. During the medieval period Wigan expanded and prospered and in 1536, antiquarian John Leland described the town, saying "Wigan paved; as big as Warrington and better builded. There is one parish church amid the town. Some merchants, some artificers, some farmers". In the English Civil War, most people in the town were Royalists and James Stanley, 7th Earl of Derby, a prominent and influential Royalist in the civil war, made Wigan his headquarters. His forces successfully captured Preston but failed in assaults on Manchester and Lancaster and two attempts to capture Bolton. Abandoning attempts to secure Lancashire, he took his forces to the Isle of Man to secure his holdings there. The Earl of Derby was absent when Wigan fell, despite fortifications built around the town, Wigan was captured by Parliamentarian forces on 1 April 1643, the takeover was complete in two hours and the town was pillaged before the defences were broken down and the Parliamentarians retreated. In 1648, Royalist forces under James Hamilton, 1st Duke of Hamilton, occupied Wigan after they had been defeated by Oliver Cromwell at the Battle of Preston. The soldiers looted the town as they retreated to Warrington, and afterwards it experienced pestilence. Cromwell himself described Wigan as "a great and poor town, and very malignant". The Battle of Wigan Lane was fought on 25 August 1651 during the Third English Civil War, between 1,500 Royalists under the command of the James Stanley, Earl of Derby marching to join the King at Worcester and 3,000 of the New Model Army under the command of Colonel Robert Lilburne hunting them. Lilburne arrived at Wigan to find the Royalists leaving to march towards Manchester but with his force consisting mostly of cavalry recognised it would be dangerous to engage in the narrow lanes around the town and decided to wait for his foot soldiers to arrive and flank the town. The Royalists seeing an opportunity to engage the divided force turned around to engage but Lilburne decided to hold his ground deploying cavalry on Wigan Lane and infantry in the hedgerows to the sides, The Royalists made several charges but after two hours were unable to break the Parliamentarian line and were forced to flee after being overwhelmed by superior numbers. Although Stanley was injured he managed to find refuge in the town. David Craine states, "those who did not fall in the fighting [were] hunted to their death through the countryside". A monument on Wigan Lane marks the place where Sir Thomas Tyldesley a Major General commanding the Royalist troops fell, it was erected 28 years after the battle in 1679 by Alexander Rigby, Tyldesley's standard bearer. Wigan was described by Celia Fiennes, a traveller, in 1698 as "a pretty market town built of stone and brick". In 1720, the moot hall was rebuilt, funded by the members of the borough. It was used as the town hall and the earliest reference to it dates from the 15th century. Prior to its final destruction in 1869, the hall was rebuilt in 1829. Wigan's status as a centre for coal production, engineering and textiles in the 18th century led to the Douglas Navigation in the 1740s, the canalisation of part of the River Douglas and later the Leeds and Liverpool Canal. The canal from Liverpool to Leeds was originally to serve Wigan on a spur, transporting cloth and food grown on the West Lancashire Plain to the Port of Liverpool. When construction restarted in the 1790s after a decades pause with coal rising in importance during the intervening years due to the progress of the Industrial Revolution the route was altered at the request of mill owners with the spur becoming the primary route and Wigan a hub for transport of coal from the Lancashire coal pits to Liverpool and Leeds. As a mill town, Wigan was an important centre of textile manufacture during the Industrial Revolution, but it was not until the 1800s that cotton factories began to spread into the town. This was due to a dearth of fast-flowing streams and rivers in the area, but by 1818 there were eight cotton mills in the Wallgate part of Wigan. In 1818 William Woods introduced the first power looms to the Wigan cotton mills. These mills swiftly became infamous for their dangerous and unbearable conditions, low pay and use of child labour. As well as being a mill town, Wigan was also an important centre for coal production. It was recorded that in 1854 there were 54 collieries in and around the town, about a sixth of all collieries in Lancashire. In the 1830s Wigan became one of the first towns in Britain to be served by a railway; the line had connections to Preston and the Manchester and Liverpool Railway. Wigan began to dominate as a cotton town in the late 19th century, and this lasted until the mid-20th century. In 1911 the town was described as an "industrial town ... occupying the greater part of the township, whilst its collieries, factories ... fill the atmosphere with smoke". After the Second World War there was a boom followed by a slump from which Wigan's textile industry did not recover. While the town's cotton and coal industries declined in the 20th century, the engineering industry did not go into recession. The last working cotton mill, May Mill, closed in 1980. In 1937, Wigan was prominently featured in George Orwell's The Road to Wigan Pier which dealt, in large part, with the living conditions of England's working poor. Some have embraced the Orwellian link, as it has provided the area with a modest tourist base over the years. Others regard this connection as disappointing, considering it an insinuation that Wigan is no better now than it was at the time of Orwell's writing. Since 2004, the town of Wigan has been divided between five of the twenty-five wards of the metropolitan borough, each returning 3 councillors to the 75-member borough council. The five wards are: Douglas, Pemberton, Wigan Central, Wigan West and Worsley Mesnes. The metropolitan council provides the local services. At the Norman Conquest, the settlement of Wigan was part of the larger parish of Wigan which, the majority of which was within the hundred of Newton. On 26 August 1246, Wigan was granted a Royal Charter, making the town a free borough. This happened after Salford was granted its Charter in 1230 and before Manchester in 1301. As a borough, Wigan was represented in the Model Parliament from 1295–1306 by two burgesses – freemen of the borough. The Charter allowed taxes to be made on transactions made in the borough by tradesmen and permitted the local burgesses to establish a guild that would regulate trade in the borough. Non-members of the guild were not allowed to do business in the borough without permission from the burgesses. It is thought that when the Charter was reconfirmation in 1350 it was changed, allowing the election of a mayor of Wigan for the first time. Three burgesses were elected to be presented to the lord of the manor who would choose one man to be mayor for a year. There was rivalry between the lords of the manor and borough. The lord of the manor complained in 1328 that the burgesses were holding private markets, from which he gained no revenue. The rivalry continued in the 16th century, with Bishop Stanley unsuccessfully challenging the right of the burgesses to hold markets, believing it should be the right of the lord of the manor. In 1583 the corporation of the borough attempted to usurp the lord of the manor by laying claim to the lordship. They did so because they felt they were fulfilling the duties of the lord: to improve waste and common land and allowing construction on this land, running courts, and mining coal. A compromise was reached, dividing some power between the two parties. Under the Municipal Corporations Act 1835, the town was reformed and was given a commission of the peace. The borough was divided into five wards with a town council of forty members: two aldermen and six councillors representing each ward. Rectors from the local parish church were the lords of the manor since records began until 2 September 1861. On this date, the borough corporation bought the rights associated with the lordship. The Local Government Act 1888 constituted all municipal boroughs with a population of 50,000 or more as "county boroughs", exercising both borough and county powers. Wigan accordingly became a county borough on 1 April 1889, giving it independence from Lancashire County Council. Ward boundaries were altered, and the county borough was divided into ten wards, each electing one alderman and three councillors. The former area of Pemberton Urban District was annexed to the County Borough of Wigan in 1904, adding four extra wards to the borough. In 1974 the County Borough of Wigan was abolished and its former area transferred to form part of the Metropolitan Borough of Wigan. In April 2011, the borough along with the entirety of the county of Greater Manchester, became one of 10 constituent councils of the Greater Manchester Combined Authority. Wigan is in the Wigan Parliamentary constituency, which was recreated in 1547 after having covered the borough in the late 13th century. From 1640 until the Redistribution of Seats Act 1885, the constituency returned two Members of Parliament (MPs); from then on it had only one. Since 1918, the constituency has been represented by the Labour Party. Lisa Nandy is the incumbent Member of Parliament for Wigan, having been elected in the 2010 general election. Wigan Council take part in the town twining scheme, and in 1988 twinned with Angers in France. At 53°32′41″N 2°37′54″W (53.5448, −2.6318), Wigan lies respectively to the west and north of Hindley and Ashton-in-Makerfield, and is about 12 miles (19 km) west of Manchester city centre and 10 miles (16 km) north of Warrington. The historic town of Wigan forms a tightly-integrated conurbation along with the Metropolitan Borough of Wigan districts of Orrell and Ince-in-Makerfield; this is connected by ribbon development to Standish and Abram. These areas, together with the West Lancashire town of Skelmersdale, are defined by the Office for National Statistics as the Wigan Urban Area, with a total population of 166,840. The town is part of the Manchester Larger Urban Zone. According to the Office for National Statistics, at the time of the United Kingdom Census 2001, Wigan had a population of 81,203. The 2001 population density was 11,474 inhabitants per square mile (4,430/km2), with a 100 to 95.7 female-to-male ratio. Of those over 16 years old, 28.9% were single (never married) and 45.0% married. Wigan's 34,069 households included 29.7% one-person, 38.9% married couples living together, 8.5% were co-habiting couples, and 10.8% single parents with their children. Of those aged 16–74, 38.5% had no academic qualifications, a figure significantly higher than the average for the borough as a whole and England. In 1931, 9.4% of Wigan's population was middle class compared with 14% in England and Wales, and by 1971, this had increased to 12.4% compared with 24% nationally. Parallel to this slight increase in the middle classes of Wigan was the decline of the working class population. In 1931, 38.7% were working class compared with 36% in England and Wales; by 1971, this had decreased to 33.5% in Wigan and 26% nationwide. The rest of the population was made up of clerical workers and skilled manual workers or other miscellaneous. The slow decrease in the working class goes against the trend for a steeper national decline, reinforcing the perception of Wigan as a working-class town. At the 2001 UK census, 87.7% of Wigan's residents reported themselves as being Christian, 0.3% Muslim, 0.2% Hindu, and 0.1% Buddhist. The census recorded 6.2% as having no religion, 0.1% had an alternative religion and 5.4% did not state their religion. The town is part of the Anglican Diocese of Liverpool and the Roman Catholic Archdiocese of Liverpool. The Grand Arcade shopping centre was opened on 22 March 2007. Construction, which cost £120M, started in 2005 on the site of Wigan Casino and The Ritz. The area around the pier is being developed, undergoing a 10-year project rebranding the area as the "Wigan Pier Quarter". Trencherfield Mill, at the centre of the pier development, will be refurbished and used to house a hotel, a restaurant, a cafe, shops, and 200 apartments. The Wigan Life Centre south building opened on 19 September 2011 housing office accommodation for Wigan Council, Wigan Leisure and Culture Trust and NHS Ashton, Leigh and Wigan and a swimming pool and fitness suite. The north building was scheduled to open in 2012. Plans for the 18-storey "Tower Grand" were suspended in 2008 due to a slump in the residential homes market. Galleries Shopping Centre houses shops as well as an indoor market. The former Westwood power station site which was transformed recently into the Westwood Park business park and features a large amount of Wigan MBC office space will be further transformed by the creation of a 55-acre (220,000 m2) textiles centre in co-operation with the Chinese state-owned trading company Chinamex at a cost of £125 million. Up to 1,000,000 square feet (93,000 m2) of manufacturing and research space will be created along with an estimated 1,000 jobs. Chinamex, which represents 70% of the Chinese textiles industry and has 6,300 member companies, will in addition offer space in the development to member companies for up to two years at a time to allow the establishment of a British subsidiary before moving on to dedicated premises. The Tote chain of bookmakers has its headquarters in Wigan, providing about 300 jobs in the town. H. J. Heinz are amongst the largest food manufacturers in Europe. Their 55-acre (220,000 m2) food manufacturing facility in Wigan is the largest food processing facility in Europe. JJB Sports, a nationwide sports clothing retailer, was founded in Wigan as a sports shop by John Jarvis Broughton (later JJ Bradburn) and was bought and expanded by businessman Dave Whelan. Girobank is also based in the town. William Santus & Co. Ltd, confectioner and producer of Uncle Joe's Mint Balls, is based in Wigan. According to the 2001 UK census, the industry of employment of residents aged 16–74 was 22.4% retail and wholesale, 18.8% manufacturing, 10.2% health and social work, 8.6% construction, 8.0% property and business services, 7.4% transport and communications, 6.5% education, 5.2% public administration, 4.1% hotels and restaurants, 2.7% finance, 0.7% energy and water supply, 0.4% agriculture, 0.1% mining, and 4.8% other. Compared to national figures, Wigan had high rates of employment in retail and wholesale (16.9% in England) and manufacturing (14.8% in England), and relatively low levels of employment in agriculture (1.5%). The census recorded the economic activity of residents aged 16–74, 1.9% students were with jobs, 2.9% students without jobs, 5.9% looking after home or family, 10.2% permanently sick or disabled, and 3.2% economically inactive for other reasons. Wigan's long history is reflected in its 216 listed buildings, of which are 20 Grade II*. As well as being a Grade II* listed structure, Mab's Cross is the only Scheduled Monument in the town out of 12 in the borough. It is a medieval stone cross that probably dates from the 13th century. 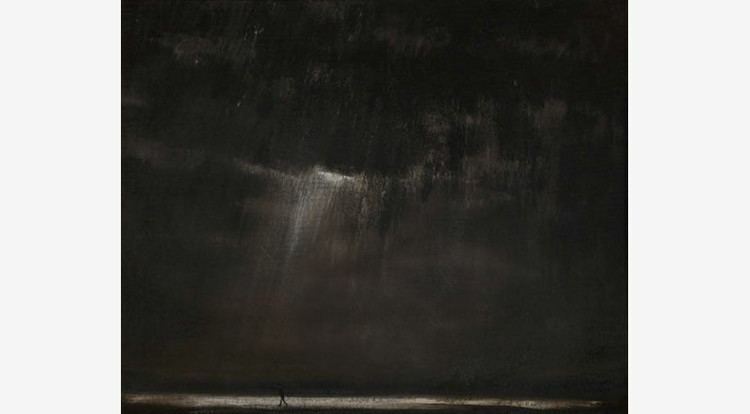 There is a legend surrounding the cross that Lady Mabel Bradshaw, wife of Sir William Bradshaw, did penance by walking from her home, Haigh Hall, to the cross once a week barefoot for committing bigamy. There is no evidence the legend is true, as there is no record that Lady Mabel was married to anyone other than Sir William Bradshaw, and several facets of the story are incorrect. Haigh Hall was built in 1827–1840 on the site of a medieval manor house of the same name, which was demolished in 1820. The hall is surrounded by a 250-acre (1.0 km2) country park, featuring areas of woodland and parkland. The former town hall is a Grade II listed building. Designed by John McClean, Mesnes Park was opened in 1878; McClean was chosen to design the park through a competition. There is a pavilion in the centre and a lake. The Heritage Lottery Fund has donated £1.8 million to regenerate the park and Wigan Metropolitan Borough Council added £1.6 million to that figure. The pavilion and grandstand will be restored. The 12-hectare (30-acre) Mesnes Park is north-west of Wigan town centre. It receives 2 million visitors a year and used to host the Wigan One World Festival. Wigan's war memorial was unveiled in 1925. Designed by Giles Gilbert Scott and funded through public donations, the monument is now a Grade II* listed building and commemorates the fallen soldiers from the town in the First World War and other conflicts. In 2006, the plaques bearing the names of the dead were stolen; a year later they were replaced through council funding. There is also a memorial on Wigan Lane which marks the site where Sir Thomas Tyldesley died in 1651 at the Battle of Wigan Lane. The Museum of Wigan Life (formerly Wigan Central Library) opened in 1878. A one-year restoration programme began in 2009 costing £1.9 million. George Orwell used it to research The Road to Wigan Pier. Today, the Wigan Pier Quarter is at the heart of a 10-year regeneration programme that began in 2006 to revitalise the area. Part of Wigan's industrial heritage, Trencherfield Mill was built in 1907 and is a Grade II listed building. It houses a steam engine over 100 years old which was restored with help from the Heritage Lottery Fund. The quarter is also home to the Wigan Pier Theatre Company, which was founded in 1986. The Face of Wigan, located in the town centre since 2008, is a stainless steel sculpture of a face. Created by sculptor Rick Kirby, The Face stands 5.5 m (18 ft) tall and cost £80,000. The 25,138-capacity DW Stadium, originally called the JJB Stadium, is located in the Newtown area of Wigan and is shared by professional association football club Wigan Athletic with professional rugby league football club Wigan Warriors. The Latics moved into the stadium upon its completion in 1999 from their former home, Springfield Park. The Warriors also moved into the stadium in 1999 from their previous home, Central Park. The 1,200-capacity multi-use Robin Park arena is located next to the DW Stadium. Association football initially struggled to take hold in Wigan with non-league clubs Wigan United (1890s), Wigan County (1897-1900) and Wigan Town (1905-1908) all folding within a few years of their creation. Wigan Borough, founded in 1919, became the town's first club to play in the Football League when in 1921 they became founder members of the Football League Third Division North. The club left the Football League and folded in 1931. They were replaced a year later by Wigan Athletic, the town's current professional football club. Latics were elected to the Football League in 1978 and the club were promoted to the Premier League, the top division of English football, in 2005. The club were relegated in 2013 and although they suffered further relegation in 2015, the club was promoted again in 2016, meaning they currently play in the second tier of English football, the Football League Championship. During the clubs spell in the top division, they were crowned 2013 FA Cup champions, defeating Manchester City in the final. Non-league football returned to the town in 2005 with the formation of Wigan Robin Park. However, the club folded just 10 years later in 2015. Rugby football has been played in the town since 1872. Wigan Warriors, originally called Wigan FC, were formed out of the Wigan Cricket Club to provide a sport to play during the winter months. During the rugby football schism of 1895, Wigan FC, along with the other leading northern clubs at the time, split from the Rugby Football Union to form the Northern Union. Wigan have been a rugby league club ever since and added the Warriors suffix to their name in 1997, shortly after rugby league had switched to a summer sport in 1996. The club are the most successful English club in the sport, winning 21 league championships and 19 challenge cup titles, as well as being crowned world club champions on 4 occasions. The club currently play in Super League. Liverpool Stanley were a professional rugby league club formed in the Highfield area of Wigan in 1902 as Wigan Highfield. The club didn't stay long in Wigan, however, relocating around England several times. Blackpool Borough briefly played in Wigan at Wigan Athletic's Springfield Park from 1987 to 1988 under the name Springfield Borough. The club is now defunct. Amateur rugby league is popular in the town, with Wigan St Patricks, Wigan St Judes and Ince Rose Bridge all playing in the National Conference League, the amateur game's top level. American Football Club The Wigan Warhawks compete in the BAFA flag league in the MEC Central division. In 2016 the Warhawks made the playoffs in their rookie season and in February 2017 they lifted their first silverware, winning the Coventry Cougars Charity Tournament. Amateur club Wigan R.U.F.C. represents the town in rugby union. Wigan's international-standard swimming pool was demolished in 2008. A new 25-metre (82 ft) pool opened in September 2011 in the Wigan Life Centre development. The original 50-metre (160 ft) pool was built in 1966 at a cost of £692,000 (£11.6 million as of 2017), Wigan BEST, named Wigan Wasps until 2004, is the town's swimming club. It has produced Olympic standard swimmers, including medal winner June Croft. Wigan Wheelers are a cycling club, originally established in 1919 who have social and competitive members from across the borough and beyond. Wigan has staged motorcycle speedway racing at two venues. Poolstock Stadium was the home of Wigan Speedway in 1947. The team moved to Fleetwood in 1948, although they raced at Poolstock in 1960. Woodhouse Lane Stadium was used briefly in the early 1950s when the team was known as the Panthers. Wigan Warlords are an Inline Hockey team, current Under-16 national champions and European Bronze medalists. The club attracts players from Wigan and the surrounding areas. Wigan's district badminton league consists of 30 teams across 3 divisions. Wigan Sailing Club operates from the 69-acre (28 ha) Scotmans Flash at Poolstock less than a mile from the centre of the town. Wigan is home to a college of further education, Wigan and Leigh College. Schools include Deanery High School, St John Fisher Catholic High School, Abraham Guest Academy. Wigan has been well known for its popular music since the days of George Formby Sr and George Formby Jr. It was the birthplace of The Eight Lancashire Lads a dancing troupe who gave the young Charlie Chaplin his professional debut. One member of the troupe was a John Willie Jackson, The "John Willie" to whom George Formby would often refer in his songs. Local bands that gained wider repute include The Verve, The Railway Children, Witness, The Tansads, Limahl of Kajagoogoo and Starsailor. The Verve were one of the most important British rock groups of the 1990s, finding success in the UK and abroad (even touring on the USA's famous Lollapalooza alternative rock festival). The band was formed when the members met at Winstanley College in 1989. From 1973 to 1981 Wigan Casino was the location for Wigan's weekly Northern Soul all-nighters. The venue began as a dance hall called Empress Ballroom. Wigan Casino rose to prominence in the 1970s, and in 1978 was named "best disco in the world" by Billboard, an American music magazine. The building was gutted by fire in 1982 and demolished the following year. This was the inspiration for the 1989 dance record Wigan by Baby Ford. 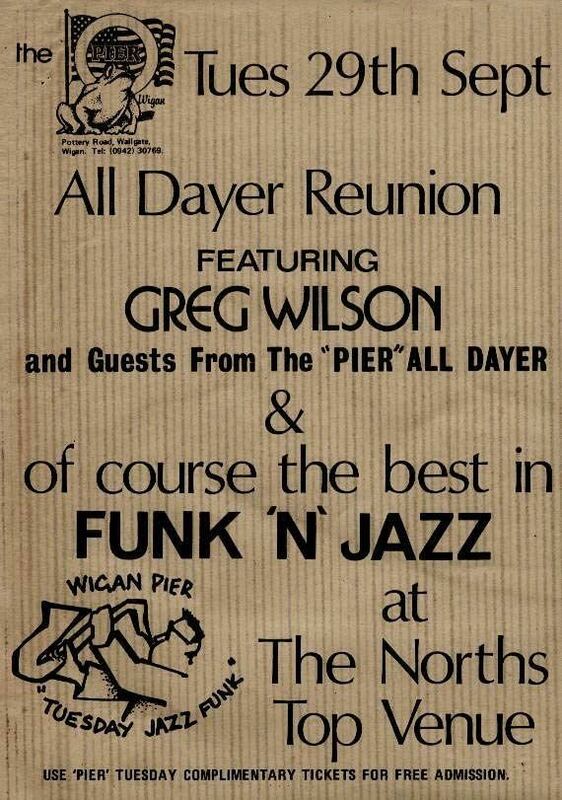 Since 1986, Wigan has hosted an international jazz festival. Wigan remains a centre of popular music for young people, with a number of alternative pubs/clubs in the town centre. The town also had a music collective which existed to promote the scene and help out local musicians and bands. They host bi-weekly gigs at The Tudor (closed 2014) and also host various other activities such as recording sessions and gig advice for young musicians. Throughout the early 1990s The Den was a popular venue for bands with acts such as Green Day heading over to play. Up until 2011, the annual Haigh Music Festival was held at Haigh Hall, Wigan, attracting around 7,000 guests each year. After Haigh Fest ended due to funding issues, a large-scale event, The Wigan Live Festival, took its place. The Lux Club was a popular venue during the mid-2000s before it too was demolished. The town currently has a host of venues putting on gigs for upcoming local bands including Indiependence, The Boulevard, and The Swinley. NXNW have hosted the annual Wigan Festival of Art, Music and Literature known as North By North Western Festival. The collective is a voluntary non-profit making organisation and the festival takes place at various venues across the town. Since 2010, the Wigan Diggers Festival has taken place on the 2nd Saturday of September. 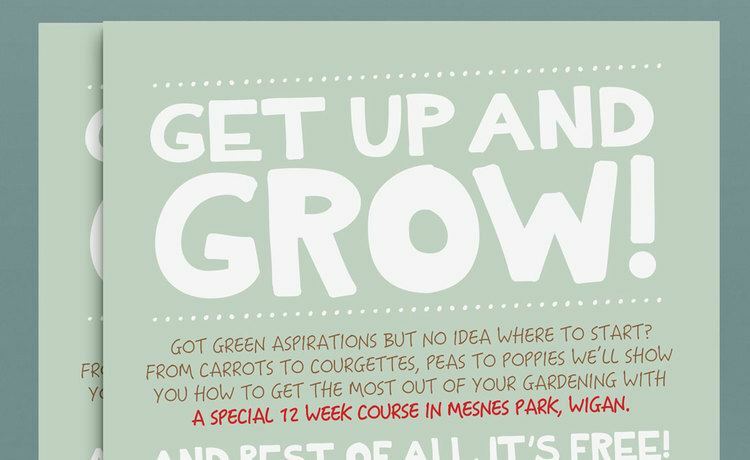 The festival brings together a significant number of socialist organisations and sympathetic musicians to celebrate the life, ideas and influence of Wigan born, Gerrard Winstanley, founder of the Diggers (True Levellers) Movement. Recent headliners have included significant Wigan bands The Railway Children and Merry Hell. Wigan is home to the annual World Pie Eating Championship, usually held at Harry's Bar on Wallgate. The competition has been held since 1992, and in 2006 a vegetarian option was added. Wiganers are sometimes referred to as "pie-eaters". The name is said to date from the 1926 General Strike, when Wigan miners were starved back to work before their counterparts in surrounding towns and so were forced to metaphorically eat "humble pie". In addition Wigan is well known as the home of Uncle Joes Mint Balls. Wigan lies on the meeting point of two primary A roads, the A49 and A577 which link to the M6, M61 motorway and M58 motorway. Increased traffic in recent years, encouraged by retail development, has resulted in very congested main roads for most of the day. This situation is linked to the town's geography, with river valleys and railway lines impeding road improvement. There are two railway stations in Wigan town centre. Wigan North Western is on the electrified north–south West Coast Main Line. Virgin Trains West Coast provides express trains to London Euston, Birmingham, Lancaster, Carlisle, Edinburgh and Glasgow. Northern operated trains to Preston and Blackpool North and a regular local service along the line to St Helens and Liverpool Lime Street. Wigan Wallgate serves lines running east and west from Wigan. Northern operate trains to Southport and Kirkby (with connections to Liverpool Central and the Merseyrail system). Frequent local services also operate (in co-operation with TfGM) to Bolton and Manchester (Victoria and Piccadilly), with most trains from Wigan continuing through to other destinations such as Manchester Airport, Stockport, Rochdale, Huddersfield, Todmorden and (until a line closure in October 2009) Oldham Mumps. Pemberton station serves the Pemberton area of the town. A horse tramway was built in 1880 by Wigan Corporation and leased to a succession of private companies to operate services to Pemberton, Aspull and towards Standish. Steam tram operation was introduced quickly, but the network always struggled to pay its way and just after the start of the 20th century Wigan Corporation gradually bought the operating leases and converted the network to electric tramcar operation. However, the network was saddled with a mix of 'standard' gauge and 'narrow' gauge lines, reducing efficiency and increasing costs, and the last of the Wigan Corporation Tramways were closed in 1931 to be replaced by buses which had begun as 'feeder' services to the trams but which had shown themselves to be faster and more flexible. Trolleybuses were operated on a single route from Wigan to Martland Mill from 1925 to 1931. The town's tram, trolleybus and bus fleet was always painted in crimson and off-white colours, with ornate gold lining out until the outbreak of World War II. The buses were notable in that they never carried exterior advertisements, with the town's crest occupying the space between decks where other bus operators placed adverts; and they carried two green lights on the front, to enable the town's ratepayers to see at night which was one of the town's own buses and not one of those of a competitor. At local government reorganisation in April 1974, the Wigan Corporation Transport Department became part of Greater Manchester Transport. The former Corporation tram/bus garage in Melverley Street is still in use by First Greater Manchester. The current network of local buses, coordinated by Transport for Greater Manchester (TfGM) and departing from the bus station in the town centre, serves Wigan and district. Wigan bus station is also served by National Express long-distance coach services. Bus companies operating in the area include Stagecoach Manchester, Arriva North West, Diamond Bus North West, Maytree Travel, Wigan Buses and Stagecoach Merseyside & South Lancashire. 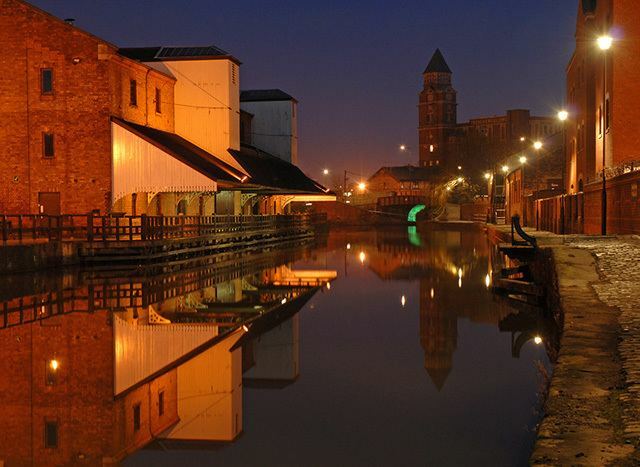 Wigan is on the Leeds & Liverpool Canal and is epitomised by Wigan Pier. There is also a branch of the canal from Wigan to Leigh, with a connection to the Bridgewater Canal linking Wigan to Manchester.